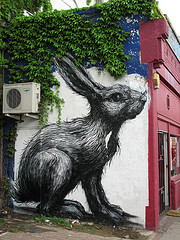 For reasons known only to itself, Hackney Council has ordered the Premises Studio and Cafe (home of the best fry-up on Hackney Road) to remove a gigantic rabbit painted on its exterior wall by a Belgian artist who goes by the name of ROA. Now if it was painted on Buckingham Palace, for example, I could understand. But this is one of the most bleak, dispiriting and ugly stretches of East London. Most of the buildings at the Shoreditch end have been bought up by a developer, who is sitting on them (ie letting them slowly crumble) until another London Yellowstock Brick monstrosity gets built, and quite frankly that giant rabbit is the saving grace of the place. Especially when you’re crawling along on a slow-moving 55. Honestly, Hackney Council. More disappointed than angry.